The pipes used to transport drinking water use different materials than those used to carry wastewater. 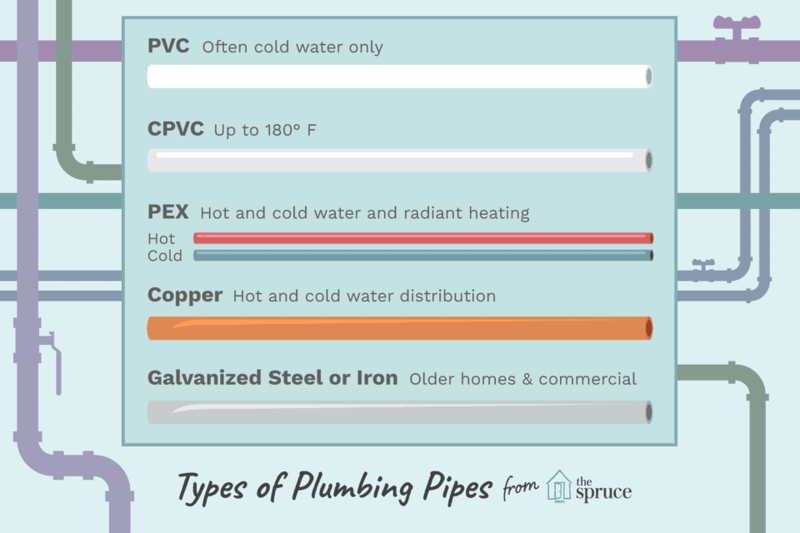 Your home may have a plumbing system that uses all one type of material for the water supply pipes, but don't be surprised to find several—or even all—of the following types of pipes, especially in older homes that have seen many repairs or updates. PVC stands for polyvinyl chloride. Of the different types of plastic pipe used for water supply, PVC has a wide variety of plumbing uses, from drainage pipe to water mains. It is most commonly used for irrigation piping, home, and building supply piping. PVC is also very common in pool and spa systems. PVC is often white but it can also come in other colors. You can often tell what it is used for by the colors and mark on the pipe. For example, purple pipe with black lettering is used for reclaimed water. PVC also comes in a variety of thicknesses called schedules. Schedules 40 being the most common for water distribution. 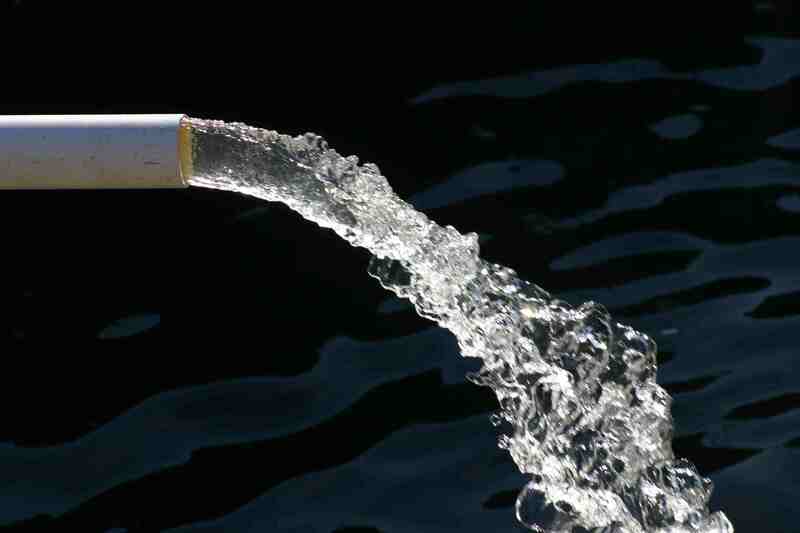 PVC is normally used for cold water pipes only. Many municipalities outlaw the use of PVC for hot water pipes, as the heat can eventually break down the plastic. Always check with local code restrictions before using PVC pipes for hot water delivery lines. PVC pipe should always be clearly labeled if it is used for both potable (drinkable) and non-potable water in the same building. PVC connections are made by using a primer that softens the PVC and then applying PVC glue that melts the joints and pipe together. CPVC stands for chlorinated polyvinyl chloride. It is often (but not always) a cream-colored or off-white plastic. This type of pipe can stand temperatures up to about 180 F or so (this depends on the schedule), so it and can be used for hot and cold water inside of a house or mobile home. CPVC is the same outside diameter as copper and PEX, so the same push-fit fittings that are used for PEX and copper, such as SharkBite, will fit the CPVC piping. As with PVC, you should use primer and a glue when making a CPVC joint. Also, make sure the glue you are using says that is can be used on CPVC. This glue is usually a different color, such as orange, so you know that it is used for CPVC. There are also "universal" pipe glues that are designed to work with many different types of plastic pipe. PEX stands for cross-linked polyethylene or XLPEl but, PEX is much easier to remember and say. PEX is commonly used for hot and cold water in homes, and for hydronic heating systems (such as radiant under-floor systems) due to its resistance to hot and cold temperatures. PEX is widely used now for its competitive pricing, ease of use, and the long rolls of piping that it can come in. PEX can be joined in many different ways including push-fit fittings and specialty PEX tools used with crimp rings to secure the joints. This type of pipe is mostly used for hot and cold water distribution, as well as being regularly used in HVAC systems for refrigerant lines. Although once used in gas piping, this is no longer allowed in most jurisdictions. Copper piping works in both underground and above-ground applications, but copper can be affected by some soils and should be sleeved if used underground. Due to the price of copper and longer labor needed to install, many builders are switching to alternative water distributions piping, such as PEX. Copper comes in different thicknesses which are labeled M, L, and K. M is the thinnest grade of copper. Copper can be connected in different ways, including compression fittings or with a torch so you can sweat solder it. Galvanized pipe is still considered a safe transport for drinking water and is still seen in larger commercial applications for water distribution. If you have a pre-1970s house, you could still have galvanized water lines in your house if it has not been upgraded.